Central Pacific Bank Vice-Chairman and CEO, Clint Arnoldus, said the company has raised over $400,000 in last year’s Walk America fundraiser, making it the leading corporate fundraiser in Hawaii. He said the company’s participation in numerous charity programs is their way of saying thank you to the community. Mr. Arnoldus speaks with Greater Good Radio about Central Pacific Bank’s philanthropic culture and why they encourage their employees to give back to the public. In his meeting with Evan and Kari, Clint Arnoldus talks about the decisions that brought him to where he currently is, one being the acceptance of an impromptu speech in front of 4000 people, eventually promoting him to his first CEO post at the First Interstate Bank of Nevada. He also tells Greater Good Radio why he thinks the managerial and CEO positions are the two toughest stages to get through in one’s career. Listen and find out more as Mr. Arnoldus shares his career-change—born out of practicality—which would eventually make him a successful banker and CEO. Clint Arnoldus was appointed Vice Chairman and Chief Executive Officer of Central Pacific Financial Corp., a bank holding company, following the recent acquisition of CB Bancshares, Inc. on September 15, 2004. With $4.4 billion in assets, Central Pacific Financial Corp. is the fourth largest financial institution in Hawaii. Mr. Arnoldus first joined Central Pacific Bank in early 2002. As Chairman, President and Chief Executive Officer, he was responsible for the overall direction of the holding company and bank operations. With 11 years of experience at the CEO level and more than 30 years of experience in the banking industry, Mr. Arnoldus has served in a number of capacities in international and domestic assignments. He most recently served as Chairman, President and Chief Executive Officer of Community Bank, a $1.3 billion commercial bank based in Pasadena, California. He also served as Chairman and Chief Executive Officer of First Interstate Bank of Nevada. At the time of his appointment, First Interstate Bank of Nevada was experiencing difficulty due to a troubled loan portfolio and regulatory problems. Mr. Arnoldus successfully oversaw the bank’s turnaround, and led it to become the top-performing bank within the 13-state First Interstate organization. He left First Interstate Bank when it was acquired by Wells Fargo and was named Chairman, President and Chief Executive Officer of The Bank of New Mexico in Albuquerque that same year. Mr. Arnoldus is very active in business and community leadership in the State of Hawaii. He currently serves on the board of the Chamber of Commerce of Hawaii, Hawaii Business Roundtable, Hawaii Community Reinvestment Corporation, Hawaii Employers Council and the University of Hawaii Foundation. 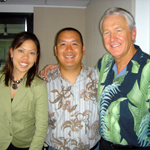 He also generously donates his time to serve on a variety of non-profit boards, including the Aloha United Way, American Lung Association of Hawaii, Japanese Chamber of Commerce, Honolulu Symphony, Japan-American Society of Hawaii, March of Dimes and the Pacific Aviation Museum Pearl Harbor. Born in Salt Lake City, Utah, Mr. Arnoldus grew up in Wyoming, Montana and California. He earned his undergraduate degree from Brigham Young University in Provo, Utah and master’s degree from the America Graduate School of International Management – Thunderbird in Glendale, Arizona. Born in Salt Lake City, Utah, on March 3, 1947 he grew up in Wyoming, Utah and California. He and his wife Lesley, have six children and nine grandchildren. Clint speaks German and his interests include scuba diving, backpacking, classic cars, water skiing, snow skiing and reading. January 2002 to Present -	Central Pacific Financial Corp.